Alastair Cook has confessed that Kevin Pietersen's ouster in 2014 under his captaincy is his biggest regret in a 12 year career. Speaking to the media ahead on the eve of his last test, Cook said "It could have been handled differently, I have a regret over it and it wasn't great for English cricket. The end of the Sri Lanka series and the Lord's Test that was the lowest I was." 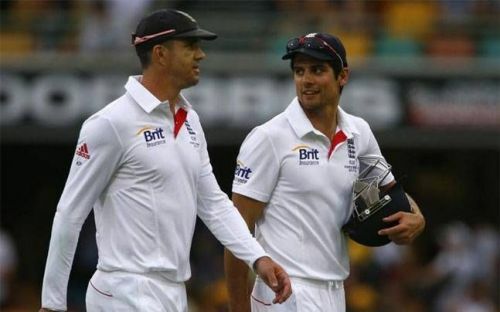 In fact, When Cook took over the captaincy from Andrew Strauss, he recalled Pietersen to the team, who Under Andrew Strauss’s Captaincy was dropped after a match-saving hundred against South Africa in 2012. He was accused of sending derogatory mails about Strauss to South African players and hence dropped for the subsequent T20 World Cup in Sri Lanka. Pietersen made a good comeback, scoring big runs that helped England win a series in India after 28 years. His knock of 186 in a turning track against the trio of Ashwin, Harbhajan and Ojha stamped his class against spinners. He also helped England retain The Ashes in the summer of 2013. However, the return leg in winter started his decline and losing 5-0 ended the careers of many senior players such as Monty Panesar, Jonathan Trott and Graeme Swann including Pietersen himself. Strauss was appointed as Director of England Cricket in 2015, the board decided not to consider Pietersen for selection for the time being citing "Lack of trust" between him and the board. Although Cook was the captain of the side during those testing periods, he wasn't the actual decision maker as he was quoted saying, "The fall-out of that wasn't great for English cricket and wasn't great for me. I was involved in that decision without being the bloke who actually made the final decision".